Later Reports Post at Bottom of Page ! ! ! The MUFON reports posted on this page are "investigation completed" reports. 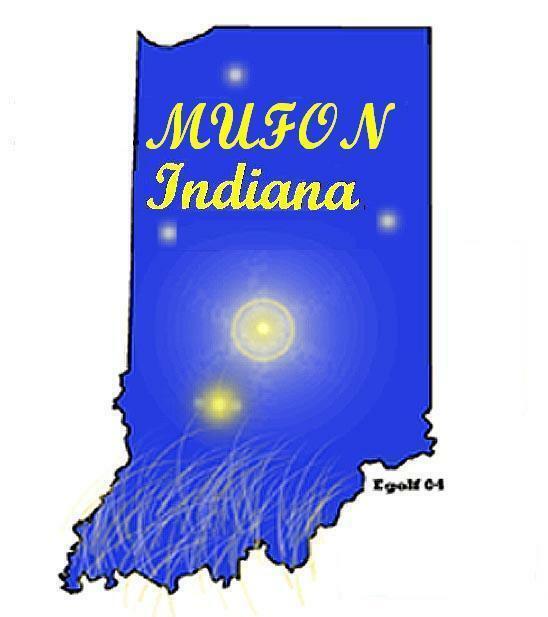 MUFON reports currently assigned for investigation or reports where no contact has been made with the reporting witness are not posted here as a matter of Indiana MUFON policy. All such reports are however part of the MUFON Case Management System data base. the kids talked about and I am glad that they had the opportunity (myself as well) to witness such an event. Attached a drawing I created using AutoCAD Inventor of what we saw. On January 16th, something was hovering above the house of a friend. His 10 year old son and adult neighbor were outside and took a picture with their camera phone. All other details would have to be gotten from them. I am a family friend who is reporting it for them. I was walking the dog, when I looked up in the northern sky and saw orange/yellow glowing light appear. They would build in intensity from a faint glow to very bright, blink once or twice then disappear. I saw as many as three at one time in the sky. This went on for almost a half an hour over a wide area of the northern sky. Very similar to what was reported from Indy and also what was reported earlier this month in Texas. However there were a lot of jets in the sky chasing the lights. As soon as the lights appeared two jets would converge on the spot. The light would disappear and the jets would return to what looked like a search pattern. I called a friend that lives three miles north of me. They went outside and saw the very same thing. At exactly 7:14 p.m. (my car's clock's time), just after I had turned north onto U.S. 421 from 146th Street (C.R. 300 S), in my peripheral vision above me I saw two bright orange-yellow lights, exactly like the ones I had seen on March 2005. They were up in the sky, only seemingly higher this time because they were not quite as big. The two lights were also much closer than when I had seen in March 2005. I would judge that the lights, when I saw them this time, were over Eagletown and, as before, they were moving slowly in a northerly direction. Doing my best to watch the road while watching the lights, what I saw over the span of about 20 seconds was both lights on, then the right one dimmed over about three seconds and went out, but came back on about three seconds later. Then the left one dimmed over about three seconds and went out. About five seconds later, the right one dimmed over about three seconds and then went out. When the left one dimmed and just before it went out, I thought I could vaguely make out a shape that appeared similar to the canopy of a small helicopter, but I couldn't be certain. The sky was crystal clear, though, and I have 20/12.5 vision. I'm pretty confident I saw some shape in the shadow of the dimming light. Hoping to see the lights again - and over a longer period of time - I stopped where it was really dark. I stood outside for about 10 minutes (it was about minus 10 degree wind chill), but never saw the lights again. I was home alone and decided to go to the kitchen. Just as I approached the kitchen/dining room area I noticed what I immediately thought was a helicopter about 300-400 feet away, just across the street and above the tree-line. Because we live in the country, I thought that was unusual... then it hit me that I couldn't hear any noise at all! And then the obvious shape difference hit and I ran for my camera. I don't know how long it was there before I saw it, but it hung around for about 2 or 3 minutes after I noticed it... not moving or flashing or anything. The only thing I noticed was a sort of wavy-ness of the air surrounding the object - that's probably what stuck me most. It resembled kind of what you see over a hot road on a summer day. It was getting dark, but I distinctly remember the dark tree line shimmering just below the object, against the sky-glow. I had just enough time to take a picture on my camera (batteries died), and then I got one on my cell phone right before it "disappeared" --- I believe it just went directly away from me at a high speed very suddenly... it appeared to grow smaller and disappear, but curved up slightly. This is the only other time that I have seen something this close in a detailed manner. The first couple nights were difficult to sleep well! 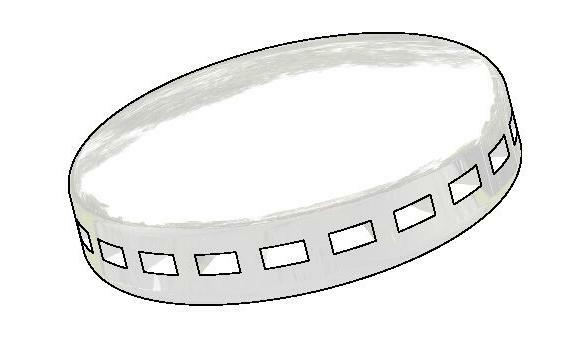 Chief Investigators Comments: The graphic supplied with this report shows a disk with seven lower extending lights. This object appears very simular to one seen on YouTube from China which is reported as a hoax. We received an e-mail from a member of the forum "Above Top Secret" questioning the same. Following description entered by Investigator. A woman and her daughter were driving home in Kokomo when they both noticed an orange ball of light (OBOL) flash on, then off seconds later while stopped at an intersection. As they were turning and discussing the OBOL, a second one appeared and performed the same performance - illuminated for just a few seconds before going dark. The woman judged the size of the OBOL to be at least a quarter held at arm's length. As they drove home, they witnessed another OBOL illuminate near or over their neighborhood. The woman called her husband who was at home to see if he could see the OBOL. Although he looked, he did not see it, and waited as his family arrived moments later. Then, together - they kept watch on the skies overhead. Minutes later, another OBOL appeared - this time to the far west - exhibiting the same characteristics but more distantly. Moments after another OBOL appeared but through their tree line and lower to the horizon before winking out. They became concerned and frightened and went inside their home. Later, the woman recalled going back outside and look again to no avail. She did notice several small planes which appeared to be circling the area of sky where the OBOL display had been. The planes all departed the area within an hour of their arrival. Investigators Note: The witnesses described the OBOL's as stationary, not moving laterally or vertically, and only illuminating for a few seconds apiece. They also spoke with friends about their sighting and learned two friends in different locations had also seen the OBOLs, one of those witnesses actually videotaping the display. While working as a deputy sheriff I was sitting in my squad car along US 41. I was watching traffic on the highway, when what looked like a ball of fire went over my car traveling in a northeast direction. I thought it was an aircraft that was on fire. I waited a minute to see if was going to crash. It did not. I then call a nearby city car and asked if they could see anything. They said that they were downtown and could not see. I then heard a northeast adjacent county Sheriff car call and said that they could see something in the sky traveling in a northeast direction. Then a County car two counties to the northeast then reported the same thing. Shortly after that a fourth County to the northeast reported the same thing. Years later (1984) while working (sheriff dept. ), myself and a reserve deputy saw the same thing at a town in the same county. The object was moving in a northeast direction. I stopped my car and we got out and watched the object. I even made a motorist stop and get out and look with us. The object then disappeared in the clouds. Investigators Note: Back in the 1970s and 1980s Indiana county patrol cars operated on the same radio frequencey almost across the state. We were driving home from Merrillville on US route 2 when right outside of Valparaiso we saw MANY bright strange lights in the distance. My son and friend were with me at the time. Objects looked like they were hovering off in the distance, some not moving, some seemed to be connected to one another then split off. We watched one move and stop in midair, then did a u turn off sorts! At first we thought it was about 15 planes flying low in a pattern. As we got closer it was noticeable that it was NO plane! It was one object, huge and made no sound, was very low and had very weird bright lights, flying very slow! As we were driving I rolled my window all the way down and stuck my head and body out the window to watch it fly over the car. The moon was behind it and emitted enough light that I got a very clear picture of its shape! It was no plane, it was triangular and had 3 very bright lights at the points! The weirdest thing was the underneath! Many lights, then one red light in the middle! My son watched it go over out the back window of the car and he saw this as well. I was scared and I told my friend to rush home to our other children. We were all scared to even turn on the radio! I was worried about what we'd hear on the news!! I am not joking! Also as it flew off in the distance it kept changing its light patterns until they looked more like that of a plane? Then it just disappeared! It was gone! Investigators note: This is a classic night time triangle report with the typical descriptions. Witness sounded sincere and was both excited and afraid of her sighting. Her description indicates the object had unusual lighting on the underside, different from the typical white/red lights report for these objects. February 17, 2008 Time: Approximately 2:00 a.m.
Around Feb 17th 2008 I had fallen asleep on the sofa and awoke early in the morning (probably 2-2:30 a.m.). Almost immediately I saw outside our wide west window in the sky a dark, heavy-bodied "aircraft-looking thing" moving across my field of view from north to south. Total view time was maybe 2 seconds. The object more like glided or floated by, not flying like normal planes do. It was not a typical plane either. The wings were connected fully along body and all looked stout. No lights...too slow...heard no sound...It appeared pretty large and it seemed to be quite close to the house, probably 100-400 feet off ground at most? It appeared to be very similar to the space shuttle, but just odd! (Too heavy-looking) It had a large tall vertical tail fin and the left wing looked to be slightly dipped toward the ground. It was very dark looking and was basically silhouetted against a bit less dark bluish sky. I tried to draw it. Fuselage was tall looking and more rounded than what my drawing shows. At approximately 1:30 a.m. my dogs started barking like they were upset over something. I look out my living room window to see about them. They were barking out towards my neighbors field/woods area. Then above them in the background I saw several lights, arranged in 3's coming from across the road at very high altitude. They were fast and declining into the woods area at my neighbors. They were very fast. I couldn't believe that air craft would come in and land so fast (The normal flight pattern for commercial/passengers planes in our area is not this direction). So I knew something weird was happening. I also noticed that the craft lights seem to be rotating in a circular pattern; red, green, blue & yellow colors. Then upon landing the lights switched to a bright beam of white light. I put on my shoes and coat after seeing 3 sets of 3 craft swoop in and land out there somewhere. I grabbed my binoculars & headed out to the front yard to watch a 4th set of 3 lights, as I could see them coming. As I'm standing there looking thru binoculars & getting them in my sights, I can hear this turbulent swish sound above me. So I tilted my head up to the sky above me binoculars still to my eyes, and to my great surprise directly above my head/yard was a craft with the same circular lights right there! All I could see in the binoculars was the lights; it was that close...so I move the binoculars away from my face and watch 3 of these things fly right over me. I think they were so low they must have barely cleared the top of my pine tree! I don't know where these 3 went. I just can't recall...I think I was in shock. I duct in on my porch because suddenly I was very scared for some reason. I came in the (house) & looked out the window. But saw nothing else going on. After that I can't even say that the last 3 I went out to watch actually landed. I couldn't see a shape to the sets that landed out there. But the ones that flew over me; definitely black, definitely triangular, but had smoothed corners, not pointed. And rotating, flashing lights of many colors. Investigators Note: Reference beam of light; was not being emitted from the object all the way to the ground. More like a bright beam of a powerful spotlight or klieg light. Witness did not actually see any landing take place. Two other sightings; 29 Feb. 2008 23:45 Witness and husband. 1 Mar. 2008 19:40 Witness and her teenage son. I had just finished repairing the brakes on a car when my girlfriend and I went for a test drive. I was going north in Jasper County about 1 mile from my house. When we stopped, turned around and headed back south, we were overwhelmed by what we seen in the Eastern sky. There were 3 sets of orange lights in a triangle pattern. Each set of lights had 3 lights in a horizontal row, totaling 9 lights. Each set of 3 lights were perfect spheres that had even distance between them. Almost immediately the lights started dimming and going away, starting with the 3 lights at the top point. They dimmed from left to right one at a time. Then the bottom left point of the triangle started dimming in the same process, left to right one at a time. Finally the right point of the triangle started dimming one at a time left to right. This process lasted under a minute. The lights were very bright, defiantly orange, and perfectly spaced between the three points of the triangle. The size of the triangle patter was very large. I would say each point of the triangle was at least 100 yards apart. It was way too massive to be one craft and I assumed it was 3 different crafts aligning to form a perfectly shaped triangle. It was truly an amazing sight. At this point we pulled the car off the side of the road and sat there to discuss what we had just seen. We were nervous, excited, and a little frightened. Never had we seen anything even close to this before. As we sat there we then seen a small cluster of dim white lights in the sky twinkling and almost seemed to be chasing each other around. They were to the southeast of where we seen the triangle pattern of lights. These lights also dimmed and disappeared. A few minutes later another set of three orange lights appeared to the south of the spot where the triangle pattern of lights was and it dimmed and disappeared. Almost as soon as it dimmed another orange set of three lights appeared to the east of that one and then dimmed and disappeared. This went on between these two sets of orange lights about 5 times in about 10-15 minutes. After sitting for about an hour, we went on home since the lights seemed to have stopped. This is by far the most peculiar thing both my girlfriend and I have ever seen in the sky. I have nothing to compare it too. I will be continuing to watch the sky over the next few nights to see if I can catch any other unexplainable lights like these in the area. March 6, 2008 Time: 7:45 p.m.
My husband and I and our younger daughter were traveling home from Monticello. We were headed north on NW Shafer Drive when my husband said look at those lights, looking to the north-eastern sky. I was driving so I could not see past him. My daughter was sitting in the back seat behind him and said "What is it?" I slowed down to pull over, but he said "they are gone". We traveled approximately 1-2 minutes more and turned onto our road when he said look there they are again; I then stopped and looked at them. They were two oval shaped bright orange lights that flashed a couple times and vanished very quickly almost as if absorbed into the sky. My husband stayed outside for awhile after we returned home but didn't see anything else that evening. When we got home our cat was hiding on porch in the corner. This was very unusual. This is not the first time we have seen these types of lights or objects appear and vanish with no noise or explanation. Sometimes they are very fast and move almost so you can't follow them. March 6, 2008 Time: 7:00 p.m.
My girlfriend and I were on our way home from the mall a couple of nights ago when I looked up into the sky and saw a strange orange light. I felt almost hypnotized by it, then it disappeared. Immediately I told myself that it was only a glare from a passing vehicle. As I was turning to ask my girlfriend if she saw anything, she was turning to ask me the same thing. So we said simultaneously, "Did you see that!!?" Skeptical, but still thinking logical, I assumed it was a cloud passing over a bright star. Or even a planet. That's when I looked and about 3/4 mile northwest of the initial observation. I saw another one and then another one right next to it. Each time one appeared... one disappeared in a timed sequence, and in a perfect, counter clockwise circular motion. Intrigued, I frantically rolled down my window despite the cold winter air. Just when I thought it was gone another sequence would appear. Each time it appeared to multiply or pulsate, and always in a perfect sequence. There were never more than three lights in each one. I saw a total of three individual sequences on the way home, (like a 5 minute time period). When we got back to the house my girlfriend was trying to convince me that it was probably a helicopter or something. It wasn't. So now we're standing in the driveway waiting on these things to show up again. It didn't take long for them to appear. This time there are 2 sequences in the sky at once about a mile apart from each other (she no longer believed its a helicopter). We also saw barely super small twinkling lights in between each pulse. I noticed that there were suddenly several of the small twinkling lights all over the western sky, moving in random directions. Some fast, some slow. Some times disappearing/appearing. I noticed a low distant rumbling during the sequences. Like an engine, or explosion, or sound barrier. Every dog in the neighborhood was barking. Just as fast as the show started, it ended. I personally can't think of a logical explanation. Fireworks? In the winter, with no sound, and in 2 different parts of the western sky? Maybe a flare? Why? And how so timed in 2 different areas? Could be a hoax... but someone would have to have a lot of time on their hands. I researched and discovered several to the "T" observation as mine. Not only that, they were in different years and in different locations. Something else I noticed in my findings is these sightings almost always occur in the western sky. March 6, 2008 Time: 8:00 p.m. Witness was taking nightly neighborhood walk when he noticed four OBOL's drifting in the NW sky. One of the lights stopped, then added lights (4) in a semi-circle pattern around the main light. After several seconds, the semi-circled lights sequentially winked out left to right. This pattern of one light becoming four lights, then winking out one by one regenerated at least 14 or 15 times, putting on quite a show. Witness watched them during the entire one hour walk; figured others had to be seeing them as well. There were at least three, maybe four main lights which would become groups of smaller lights, sometimes alone, sometimes simultaneously w/other lights. They generally moved from the north to southwest over northern Kokomo - it appeared at least one flew right over Bonnaire School. There was no noise, and nothing conventional made sense. The lights wouldn't fade out - they were either on, or off, like someone flipping a switch. All the lights, even the smaller ones in the semicircle patterns, were of an orangish color. By the time the walk ended and the witness entered his home, the lights were nearly gone from his view. He came back outside a few minutes later and the lights were completely gone. Witness has not seen any aerial phenomenon in many years. Doesn't have any idea what they were, but pretty sure they were NOT conventional aircraft, or flares dropped by aircraft. My wife and I were driving home tonight when we pulled up to an intersection about 35 miles west of Ft. We were facing south and were looking off to the west-southwest. It was hard to tell distance, but it definitely didn't look far off maybe 7 to 10 miles. There were 6 stationary bright lights in the sky. There were two rows of three lights and they were positioned as if they were on a boomerang that was tilted forward slightly towards us. We came to a stop and then they disappeared quickly one at a time. The lights definitely didn't accelerate. They were there and then they were gone. From the time the first one disappeared until they were all gone was a matter of seconds. But none of them left at the same time. Everyone disappeared individually, in a sequence. When I first viewed them I thought it might be a refueling tanker out of Grissom ARB down around Bunker Hill/Kokomo area. They don't usually fly in that area, but they do training over our general area, so it wouldn't be out of the question to see a plane in that area. But there were too many lights with no strobe lights to reveal an aircraft. There are no cell phone towers in that area that could possibly give the illusion of lights disappearing. There also was no movement to the lights. No side-to-side or towards-or-away from us. It was hard to believe. I watch a lot of the UFO Hunters and UFO Files on the History Channel and usually am a skeptic. If I hadn't seen this with my wife, I'm not sure I would have believed it other wise. It was quite an amazing experience. I just wish I would've had a video or photo camera with me. I was speaking to my husband on the cell phone as he was returning from work when he yelled in the phone "what is that?" Just by his emotions, I knew he was startled and asked him where he was. He had stated just down the road from our house. I looked in my large south window (overlooking our driveway) to see 3 large amber looking orbs in a linear fashion just above tree top height. They lasted approximately 10 seconds but then disappear and reappear. Immediately after seeing the orbs I noticed in the northwest sky a beautiful display of sequenced flashing white smaller lights. These lights lasted only about 30 seconds and they looked to be much higher in altitude and consumed a large portion of the sky. These lights could not have been jets as they have several lights on the crafts. The lights that I saw were many singular separate bright lights that were in some sort of sequence. I couldn't tell if the lights came from an extremely large craft or many smaller ones. My eyes then gravitated back to the tree line to later find more orbs returning. These orbs would fade and reappear sometimes in the same location. The total sighting lasted approximately 30 minutes. My husband watched most of this outside but I was inside with my very scared and startled children. They witnessed this as well. I spoke to law officials and they told me that they were military jets dropping flares. (We do not have an active base in our area and I almost never see military jets over our skies. Never seen or heard of this before.) Later, I asked my husband what he saw on his way home and he said that he saw 3 bright lights in a "V" formation that hovered without any sound. He said that it looked to be the size of a house. This was such a surreal event, I'm still struggling to believe what I saw but I am convinced that what I saw was not from around here. Tried to capture this on my digital camera but did not pick up images very good. Investigators Notes: Submitted second report regarding return of the lights on Friday night March 28, 2008. I was watching TV joking it was such a clear night to be UFO watching. (We are doing this since seeing unexplained objects in our skies lately!) Standing at my big window when I saw one bright orange light in the sky that sharply turned right or to the east. I didn't say a thing until it came back a second time in the same location. I gave my husband the strangest look as he was sitting on the couch. Other family members told me I was seeing things and that these things would not come back a second time!! They couldn't believe his eyes. Shortly after the first 2 orbs towards the west, we saw a linear line of 4 lights just above tree top height. These lights came on one at a time and dimmed one at a time but were much closer together and not as bright reddish/orange this time. I would say that the lights/orbs looked much different and acted much different. I went outside and was not scared by these lights. I called a person north in Rochester and asked them to go outside and see these things. They said "Oh my! I see three lights. They look like head lights on a car in the sky." As I watched these lights come and go they moved fairly slowly towards the east. I did notice a large number of jets in the skies this time but no sounds whatsoever. The incident only lasted maybe 15 minutes. Investigators Notes: Investigation confirmed above information and documented area graphics. Sighting area is directly north of the MOA area sighted in other reports regarding the March, 2008 flap. March 6, 2008 Time: 8:06 p.m.
My wife and I were going out in the country to feed our horses. As we were driving through the country I saw three redish/orange lights above a field. I said what in the world is that? She said stop and let's watch. I stopped and the lights were there and then they faded off. We continued to watch with the car turned off and they reappeared but this time they were separated from each other. Then they faded off one at a time and a few seconds later they reappeared, all three together again. We continued to watch them and they separated, again and would fade on and off one by one and appeared to be moving away to the north. We decided to continue on to my horses and they (lights) were about 5 miles east of the area of the sightings. We were almost at the farm where my horses are kept when my wife screamed for me to stop. I stopped and the lights had reappeared again only closer. I remembered that she had her cell phone with a camera and I said take a picture! She was trying to get the camera ready and the lights were three together white this time with one off to the left that was reddish/orange. As we were watching the lights went from a horizontal pattern to an angle and started to move towards us. My wife got scared and screamed "go! go!" They are coming towards us! I didn't move. I sat there watching and they stopped and hovered in one spot then faded off slowly and the one to the left faded off. (When I use the term faded I'm not referring to fading like moving away I'm talking about like when you use a dimmer switch and dim the lights slowly.) We continued to watch the lights continue to come and go until they finally got too far off and faded out. The whole thing lasted about 40 minutes and left us really excited and a little freaked out. I know what we saw and they were not planes or hot air or weather balloons. Investigators comment: Unable to contact witness. Case considered "unknown" due to the nature and content of witness supplied data, but with insufficient data stipulation due to no witness response. In the fall of last year my father sighted a large craft flying slowly over our house after midnight. We've both seen this craft several times since, but the sightings stopped before New Years 2008. Around March 10th of this year, I heard the same sound that accompanied this craft again. It was shortly after midnight and I was watching television. I ran outside and saw the craft over the house. I thought it was military but it was too large to be of Earthly origin. It was Y-shaped, 100 yards long, but moved slowly, almost in a hover. It was dark, covered with what resembled hull plating and had a large band of blue lights along its midsection. It made a sound like a very low hum which you could feel in your chest. The craft hovered for a few minutes, and then moved slowly east until it was no longer in my range of vision. The first time we sighted it, we were perplexed. Now we're concerned, because of the frequency of the sightings since. The craft seemed very interested in our neighborhood. On every night before we've seen the craft we felt like we were being watched. The feeling that makes the hair on your neck stand on end. Investigators Note: Both witnesses claim to have heard and seen this UFO several times over the past month. First indications are; extremely low hum that gets louder as the UFO approaches. When it appears overhead the hum can be felt in chest and stomach. UFO appears as a gigantic 'Y' shape with the leg of the Y leading; several blue and green lights (steady on) can be seen on the leading leg of the 'Y'. Lights are reflected on the 'gray hull plating' and there is a strange 'I' shape protuberance at the juncture of the 'legs'. The object passes directly overhead at about 1,000 feet and travels 'at a jogging pace' until out of sight. I was driving west and as I approached the intersection of U.S. 31 I noticed three bright, orange lights in the western sky in front of me. They were just above the treetops. I first saw one light, then a second one developed and grew brighter. Finally a 3rd one developed and grew brighter. They were approximately the size of a baby aspirin at arms length. They were all steady for a brief moment and then one by one, they each faded into the darkness and disappeared. It happened rather fast, a little less than a minute. I drove to the post office parking lot where I could get a better look. As I drove, keeping my eyes on the spot where I saw them last, I saw one more light flash-on for a second or two and then it faded into the night like someone dimmed the switch. It was VERY odd how it faded into nothingness from this immensely bright light. Just prior to my leaving the home I noticed that my two outside dogs were barking like maniacs at something outside. Even the inside dogs were hysterical. And so were my several pet birds. Now I wonder if it had something to do with these lights as they would have been clearly visible from my house and I know the last time I saw them it was about 7:45 PM. I know they hang around for a while when they show up and I sure would like to know what they are. They are ABSOLUTELY NOT an airplane or anything I have EVER seen before. March 30, 2008 Time: 4:35 a.m.
On my way to work while just staring at the sky I saw an unusual light pattern. I was traveling south bound on I69 just north of 96th Street (approx. ¼ mile) in the Indianapolis/Fishers area. I first thought this may be an electrical occurrence on some power lines but remembered there are no power lines on my drive. The light was a low intensity, translucent, white to very light blue in color, and oblong in shape. The size was similar to that of a beach ball, maybe a little bigger. The light rapidly moved north at my guess of 100+mph perpendicular to the outside shoulder of the northbound lanes; its altitude was approximately 30' above the ground. I saw no object related to the light. The light seemed to pulse/flash at every length of its width in travel, a very rapid pulse considering the speed that I surmised. I tried to keep view of the object but traveling at 60 mph and crossing a lane inadvertently I lost sight of it. This all seemed to last no more than 3-4 seconds for me. It was an orb with a deep red color and about the size of a softball. I was standing in my front yard when I saw it in the field across the road. It moved very slowly across the tree line. It took about 15 minutes for it to get across. After it cross the road it went past me toward the corner of my house and disappeared. Investigators comments: Witness described orb came within 30 to 40 feet away and went past the corner of the witness house. Witness went to corner of house and the object was gone. There was no wavering, or dimming of object. Witness state she asked neighbors about object but no one else saw it. The witness was very knowledgeable and articulate about aircraft in the area. Was very insistent in stating she never had this type of experience before. My friend told me of recent UFO activity at night that he and his entire family have witness on regular occasion. Lights dancing in the night sky and hovering. After going to his house and witnessing it for several hours, these star like objects appeared with an average of 7 plus in the sky at any given time. They rapidly change color, and when viewed through binoculars or telescope appear to consist of color streaks of blue, white and red, somewhat like the flag. They have been out every clear night and they just go in every direction, go side to side, circles, and I even witnessed two separate objects split into two lights each, then form back into a single light of their own. Having just seen these star like shapes recently, my friend told me about how bright they actually get, being so bright that you can name off each color with the naked eye. It seems like the objects are just sitting and observing in the sky while "dancing" at the same time. Also, tonight I witnessed one shoot up in front of a commercial aircraft headed east, as if to say "look at me". My feelings toward it is this, I've tried ruling out every single possibility from TV shows I've watched and common sense. They are defiantly not airplanes, satellites, weather balloons, stars, or flares. Driving north on Manchester Avenue, my daughter and I saw an object with large, solid white lights flying extremely low above the neighborhood. We live in the east approach flight path to the South Bend airport, and because the object was flying in the opposite direction of the landing path (heading south, then turning west) and was so low, I originally thought a plane was crashing. Then as it came closer to us, we could see that it wasn't a plane and we couldn't figure out what it could be. We were thinking it was triangular in shape. It had a small light in the center and at least 3 large solid white lights on the tips. We are estimating the shape, because all we could see were the lights. It turned very slowly, westward, and increased its speed and disappeared quickly. We tried to follow it but lost sight of it immediately. There was no sound, which was unusual due to its close proximity to us. It looked like it could brush the tops of the tall trees on the street. The whole experience lasted no more than 30 seconds. I really wanted to follow it to see what it really was. My curiosity dominated my emotions at that moment. Later, we felt vulnerable and intimidated. My daughter felt as if there were malicious intentions. I was standing on my balcony facing south having a cigarette. Finishing my cigarette, I turning to enter my apartment building however a bright light in the Eastern sky caught my attention. At first, I suspected it to be an airplane that was approaching the Purdue Airport. The light was amber or light orange. It was bright enough that I thought this "airplane" was close enough and traveling at such a speed that it would fly over me in under a minute's time. I judged its distance to be about 15 city blocks. I waited for the "airplane" to fly over me but the light remained still and fixed in the same position of the sky. Then the light disappeared for a fraction of a second. A fraction of a second later, 5-7 similar lights formed a circle in the same position of the sky as the first light. I wondered if it could be a flare or a firework but the circle of lights was stationary and did not move. It twinkled a small amount, then they either disappeared again for a fraction of a second or they repositioned themselves very quickly into a straight line horizontally. This horizontal array of lights then appeared to move very slowly toward the North from my point of view. At this point about 5 seconds has passed. Then from this horizontal line of 5-7 amber colored lights, another separate array of lights also in a line and about 5-7 in number projected from the horizontal line, upward toward a vertical position. The way this second line projected itself was similar to the way a "movie click board" opens up. The angle the lines formed was open to the North. At this point, about 10-12 seconds has passed. There are two "lines" of amber lights forming an angle opening to the North, with each line consisting of 5-7 lights. This entire formation of lights then seemed to disassemble. The lines seemed to detach and then each light seemed to move independently. The way the lights moved was such that they revolved around each other in various paths. Subjectively, it appeared that these lights were putting on a "display" or a "light show". Finally at about 15-20 seconds from initially spotting the first light, I ran inside of my apartment to get my roommate to witness this event. However, when we returned the lights were gone. I now believe the distance of the lights I witnessed to be much farther than 15 city blocks. I believe this is because many witnesses in Kokomo have seen similar things. I deduce that this event took place somewhere in between Lafayette and Kokomo. Investigators note: Witness stated that a few minutes after this sighting as he was showing his friend where in the sky he had seen the lights, he noticed several jet aircraft criss-crossing the area of the sky forming almost a grid pattern. Witness is well spoken and is an amateur astronomer well familiar with aircraft and the night sky. I was driving east across Harrison street bridge into Lafayette when my friend and I both noticed a large single light in the sky. It was in the east, but not far away, it looked like it was just a couple thousand feet up and over Lafayette. It caught both of our attention but nothing was said until it began to move and pulsate. At that moment, we both said "that's not a plane". 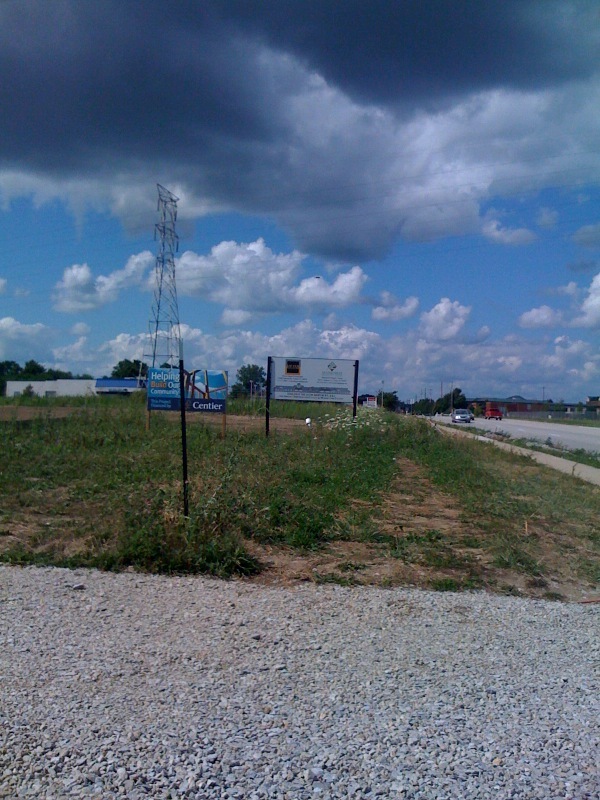 (Purdue University has a small airport. It is not uncommon to see small aircraft about to land. That is not what this was) The large pulsating light then turned into 3 lights in a triangle. 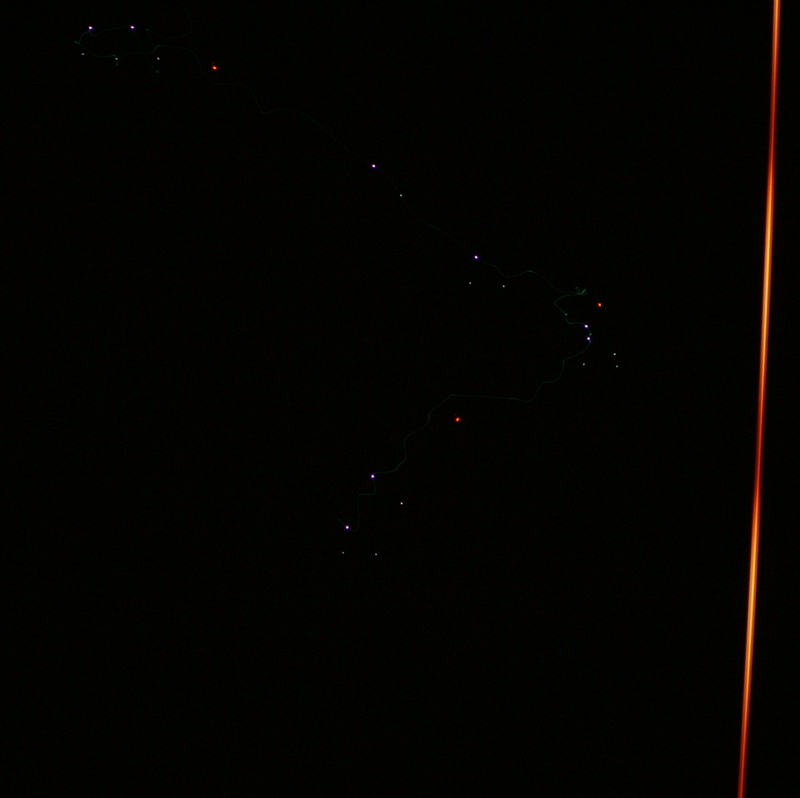 The lights were stationary and in a triangle formation for about 10 - 20 sec. Then they pulsated and turned into a horizontal line of 5 or 6 lights that appeared in a sequence. (I'm not sure if the lights actually moved or if the line appeared as the triangle went out.) This line of lights was totally stationary, not falling, and lasted for another 10 - 20 sec. Before the lights were gone, we were over the bridge and able to pull over and get out of the truck. There was no sound. The next day I heard people talking about a "sonic boom" in Kokomo, which is an hour away, but that was really all I heard until UFO Hunter's aired in November about Kokomo! Some of the sightings are very similar to what I saw. They were NOT flares. I was leaving a building on campus and looked east and saw 7 evenly-spaced lights stationary in a boomerang orientation in the sky. They were roughly 60 degrees off the horizon and lower than most commercial aircraft. They were bright and I thought they were warning flares being dropped. I watched the far-right light disappear, and a new one appear on the left leg of the boomerang; then a second light follow suit. Then all the lights simply disappeared. In total I saw them on for about 5-10 seconds. They were all the yellow-white color similar to a older car's headlights. No planes were seen or heard. The sky was completely clear, with stars and the moon visible. I thought they were flares at first, but I have never seen flares go out, new ones appear, and then all go out in unison (including the most recently visible ones). If they were flares, they would have continued to burn out at a constant rate! Plus they didn't dim slowly enough to be a flare or a firework burning off. The group of lights didn't move through the sky at all. There have been reports on the local news about a loud bangs from meteors and military planes in the area breaking the sound barrier. If they were military planes with their exhaust ports facing me, why did they simply turn off without changing color or shape? Investigators comments: There were no other reports of like or similar events. I was looking at the eastern sky, very high up, watched two points of light traveling north to south. One appeared to be the front of the object and the other the rear. These points of light stayed at the same distance from each other which was several miles apart and both moved at the same speed, traveling at a very high altitude. If these were two planes then they were traveling the exact same heading and at the exact same speed. I have never seen two planes do that at that altitude that close together. These lights moved from north to south in perfect straight line to each other. Investigators comments: Object was observed in witness's backyard at approximately 35,000 feet altitude. Fort Wayne International airport is 5 to 10 miles away. It was chilly and about to rain. Clear but clouds were coming in from the south. Witness was former USAF and acutely aware of terrestrial aircraft. Possible satellites but direction of travel and altitude would be unusual. I was driving home and it was pretty dark. Listening to some music on my way, I was very distracted when I suddenly saw some object in the sky. It is not like those times when you look at the sky and see a airplane very high. The object I was looking at was at a very low altitude, and it was traveling at a very moderated speed, it was not going fast at all. I was shock when I first saw it. I was looking at it while I was driving and it was moving opposite to my direction, so it was getting closer to me. I saw it very clear, very, very clear.... I could not believe what my eyes were looking at!!!!! It was kind of a square/rectangle shape, it had 4 lights...One in each corner, it didn't had much color, but very bright white lights. So I turn into a Midas car repair building parked there, I saw it go west and decided to follow it. I had my computer laptop in my car but I thought that by the time my computer was ready I would have lost the object. I decided to try and follow it but then this big truck got in my way, which was going very slow for some reason. I saw other cars where going slow too....... And I lost the object....I tried to look for it, remembering the direction it went, but had no luck. I was very excited. I have a Google picture of how the object looked. It was squared shape, IT WAS NOT AN airplane or helicopter...It had 4 very bright white lights in all 4 corners. I heard a strange motor humming sound that I never heard before. I looked and tried to see where it was coming from and suddenly the sound was above us. There were a number of lights quite low and in triangle shape above us. It went over us slowly and I followed it by eye as it crossed over US30 to the south until I could no longer see it. I thought it was a plane at first until it got close enough for us to see that it was not. I was dumbfounded and a little scared at the time. I am still scared to think about it. The lights were not pulsating and I could not see a body to it, only the six or seven lights. It was only traveling about 20 miles an hour. Everything became still after it passed for a while. No crickets or any thing made a sound afterwards for about 10 minutes. At the time when we first saw it we were getting ready for a camp fire. Investigators Comments: Sighting occurred while on a camping trip by the witness and was also viewed by her son. Witness was only able to see the lights and no apparent body or shape within the lights. A dog barked during the sighting but stopped when instructed to do so. I was coming home from work on IL-14, when I looked north above Grayville, Il and saw two or three of the amber orbs. First one appeared, then one came below and to the left of it, then possibly another. I continued to watch the sky until I got home. When I arrived I got out my camera and tripod. I believe it was about twenty minutes before I saw anything else. The description is exactly the same as my reports from 9/11/07 and 9/12/07 in Indiana; there were the two on that date if you wish to look them up. The difference in this sighting is that I could see small dots of light splitting off from the orbs as they lit up, and continuing on in the sky to repeat this again. The orbs lasted only seconds on this occasion and there were about eight in all; most were caught on tape. The attached video has been recoded to wmv9, thus losing some quality however the important aspects can still be seen. I had to let my dog out I looked up and saw something flashing. I originally seen one and I tried to get it on video. I couldn't so I moved my camera and then realized I had one on my little screen. So I filmed it for over 5 minutes then one just appeared from nowhere! I then got them both together on film for over 3 and 1/2 minutes; after almost 10 minutes of total footage I had to turn off the camera because the one disappeared as easy as it appeared in the first place. I got a little freaked, grabbed my dog and we ran into the garage. I do not know where it went but I wasn't going stick around to find out! Investigators note: Video referenced is not available for viewing. Looked like the shape of a human but was flying. When I looked out the car window it appeared to have wing movement. It was all black. My husband, son and I were driving westbound on US30 in Indiana. I saw a black object. My husband thought it might be a kite. I said no, it was moving around coming toward us. My son in the back seat on my side saw it too. It had just rained and when I first saw it, it was darker than the cloud. When it got above us I looked straight up and it appeared to have wing action. My 16 yr. old son asked what is it? I said I didn't know. When I first saw it in the distance it looked like there were two of them and the one just vanished. After a few minutes of watching it, it just vanished as if it went straight up, but fast. It was all black and in the shape of a human. No lights. No sound. It wasn't going in a line. It was more moving fluently. It was dusk, just before it turned dark. Light enough that somebody else had to see it! All you had to do is just look out your window. I just wonder if anyone else saw it. You couldn't miss it. I have no idea what it was. I've never seen anything like it. It almost looked like it was wearing a cape. It was just flowing. When I looked straight up out the window I saw something that appeared to be wing action. It wasn't close enough to describe it fully. It was close enough that a lot more people should have seen it. My husband was driving and couldn't see it except at the start. My son and I watched until it vanished. When it vanished it looked like it vanished into nothing. I felt like it wasn't something I'd want to see face to face. I felt like whatever it was, it wasn't good. It seemed as if it were trying to get somewhere in a hurry without worrying who saw it. After seeing this I just can't help but wonder if anyone else saw it. I'm not a big believer in stuff like this but I can't explain what I saw. I know what a bird and airplane look like and this is nothing I've seen. I am a truck driver and was pulling out of and driving north of South Bend Indiana with a load. I was watching light bugs in the trees and bushes on both sides of the highway. It was dark, but the half moon was out and bright in the sky. On the west side of the freeway beneath the moon, I saw stars in the dark sky. My attention was caught by a dark mass in the sky that seemed to be back lighted. I looked back at the object several times until I finally noticed that there seemed to be lights under the bottom half of it. The lights were very bright, and the object was moving very slowly. I slowed down trying to maintain eye contact. I finally pulled my truck to the shoulder and got out of my Tractor. The object was still moving slow enough to be mistaken for a balloon and that was what I thought I would see it to be. The object was rotating. The lights on the bottom were now facing me and were clearly in an oval pattern around the outer edge of the object. I tried to take pictures with my camera but it wouldn't focus. The object was maybe 1.5 miles to my west. Maybe 50 to 60 yards in length and floated across the sky while appearing to corkscrew through the air (revolve). It seemed to stop and then right or adjust itself. The lights on the bottom of the object brightened, and suddenly the object "rocketed" forward. It moved away very quickly but I still saw the light for a good 60 to 75 seconds longer. There was no sound. When I finally lost sight of it in the night I jumped back into my Truck and headed toward Benton Harbor, Michigan. I was excited by what I saw and sent text messages to a friend and a nephew. By the time I got to Benton Harbor 35 miles to the north, I was on my C.B. trying to see if anyone may have seen anything. One driver at the Benton Harbor truck stop told me that he saw fighter jet planes in the night sky but I wasn't sure if he was telling me the truth? they blinked off, and then 5 appeared. lightening shots, rainbows, planes etc. a 300mm lens at 5.6 to get this shot. I have up-load the attached picture. so I cropped and zoomed in a little. Witness was awaken early at 1:30 AM by pet dog barking at something out side the a bed room window. 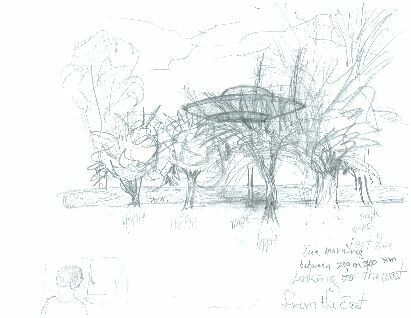 Witness looked out window and saw a disk about 80 feet away hovering over a close-by artificial pond. The object was approximately 30 feet above the pond approximately 80 feet from the witness home. 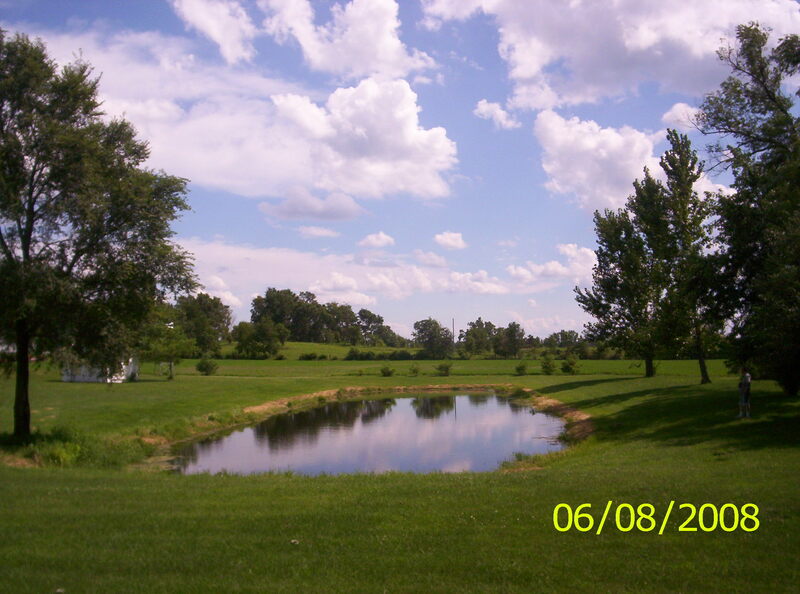 The pond is approximately 230 by 45 feet. There are several fruit and small maple trees between the witness home and the pond. The disk was observed through and just above the trees as shown in the graphic. The disk was approximately 30 feet in diameter and 15 feet thick. The sighting lasted approximately 5 minutes until the object just disappeared. This sighting occurred between thunder storms on this evening with a storm previously passing through about two hours previously. The sky was broken clouds with between cloud lighting occurring. There was no wind during the sighting event. The lighting flashes in the sky lit up the disk when they occurred. Red rectangular lights on the bottom portion of the craft rotated from right to left and reflected off the pond surface. The bottom of craft appeared to be a metallic blue with a shimmer to it. Water in the pond below the craft appeared to ripple. The dome on the craft was unlit. More Lights in the Sky.........? ? ? ? We were in my parked car facing east waiting for the school bus. I saw a bright light moving south east. It was rather bright and moved like a plane. I was watching it trying to figure out what it was, when it began to flicker. It then became very bright and seemed to change colors and then it shot off straight east and disappeared. The sky was very clear. We could see the stars clearly, but there was no sign of it. Investigators Note: Witness owned up to this report as a prank. After watching an episode of UFO Hunters on TV they wanted to see what would happen if a fake report was submitted to MUFON and to find out if MUFON was real.